The New York Red Bulls selected three players in Rounds Three and Four of the 2019 MLS Superdraft on Monday via teleconference. 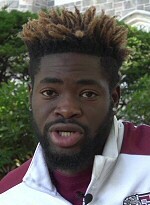 The Red Bulls selected Fordham goalkeeper Rashid Nuhu with the No. 70 pick for their lone third round selection. In the fourth round, New York then drafted Princeton midfielder Sean McSherry and West Virginia midfielder Joey Piatczyc with the No. 78 and No. 84, respectively.